Another fun idea for the Thanksgiving table is to get a big white or light piece of paper or an inexpensive white tablecloth and put it on the main table. 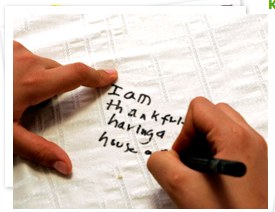 Before or during dinner have everyone write one things they are thankful for on the tablecloth. You could add handprints on it too if you wanted to get really creative. This could be a yearly thing where you add to it or do a new one each year. What a fun way to remember what you are thankful for on Thanksgiving. Make sure you use fabric markers so that it can be washed and used again each year! Handprint & Footprint Dish Towels – Great Gift Idea!